Handbook of Toxic Fungal Metabolites presents UV, IR, 1H NMR, 13C NMR, and mass spectra for identification of known mycotoxins or related metabolites by both chemists and researchers. 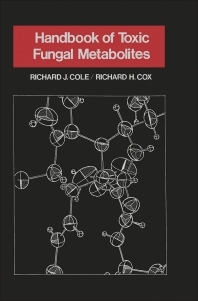 The handbook is oriented primarily toward fungal metabolites that elicit a toxic response in vertebrate animals. It also contains metabolites that show little or no known acute toxicity. The handbook is divided into 21 sections. Mycotoxin and fungal metabolite members are considered into each section based on their chemical relationships, except for the last four groups, Aspergillus, Penicillium, Fusarium, and miscellaneous toxins. The final section focuses on miscellaneous toxins that could not be classified under the considered categories, namely slaframine, diplodiatoxin, and roseotoxin B. This handbook is of great value to mycotoxicologists, and food and feed researchers.